Z is always running out of room to hang his artwork on the fridge. So, when I found this idea for a magnet board on Pintrest a few weeks ago I ran out, & picked up a drip pan. Once I figured out a good spot to hang it, I realized it was an awkward size. My solution? Get a second one, & trim them down to size. Before they guys packed up the tools last weekend, I had them cut the pans for me. 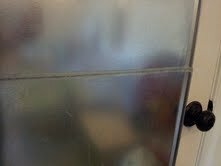 Then, today, I hung them on the back of the door with some heavy duty Velcro strips. It is AWESOME! The kids were so excited about it. Well, not excited enough to put down the chocolate milk, but they liked it. To cover up the sharp edge from cutting, I overlapped the edges, & ran a line of silicon caulk over it. Once it dried, the sharp edge was gone. 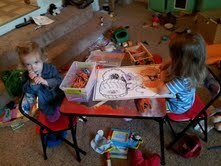 Both kids got right to work coloring pictures to hang up. We've already added two more pictures. I LOVE this idea. So creative!